In 2007, just two months after I started FiveJs.com, I posted my very first worksheet set. It was a very basic black-and-white set of charts and worksheets to help my children learn the months, their corresponding numbers, and their order. Over the years, readers have suggested I add some other topics to that set of worksheets (such as month abbreviations, seasons, and Leap Years), but I never seemed to find the time to update them. Obviously I've finally gotten around to making those changes. In addition to including the new information, I've given the original worksheets a complete overhaul so they're a lot more colorful (and hopefully user-friendly) than they used to be. I've also included an answer key to the worksheets as well as a set of printable flashcards. 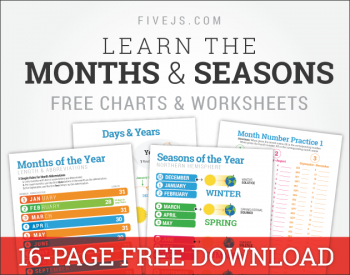 What Topics are Included in the Months & Seasons Worksheet Set? The worksheet set is free for personal use. If you'd like to use the worksheets with your class or co-op, please email me for permission. I printed the black and white ones and liked those, but these are super cute! Can't wait to use them with my younger kids. Thanks for all of your hard work! Can I just say, "WOW!" Thank you for sharing this. I can't tell you how much I appreciate all the mammas who are willing to share their creative approach to educating their children. It makes life so much easier for us newbies! Thanks so much for this! Need to help my son since public school isn't working on this as much as they should! A big THANK YOU! 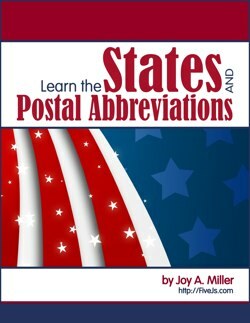 This is very helpful and a fanatic site. Thank you so much! I found these printable's just in time for my Pk-5 daughter. They are great! Thank you.